My wife says that she is really happy I found this product for her. And I am not going to argue with her. 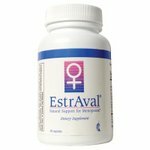 EstrAval is an exclusive combination of plant estrogens to help bring welcome relief from monthly discomforts and menopausal symptoms like hot flashes, night sweats, and mood swings. Packed inside each EstrAval capsule are soy, dong quai, and black cohosh—in the research-recommended doses.